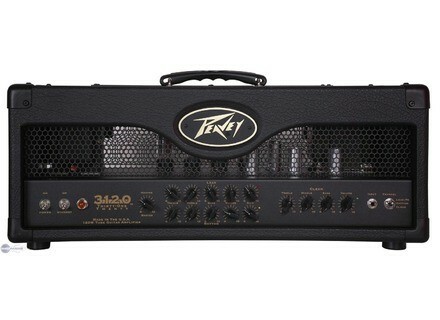 3120 Head, Tube Guitar Amp Head from Peavey. Pieceofmap's review (This content has been automatically translated from French)" Versatile ..."
3 channels, I'm not a fan, I only use 2, I find the Lead somewhat useless. The config is what is so easy, you can just fix everything very simple, I like it, behind there is even a setting to shake HP baffle. I whistled a feedback unbearable, but there will I repair takes her, the clean is great otherwise. I did not know Peavey but it proves strong enough. I do not think keeping it eternally. Simple connection: an input, an effects loop, two speakers outputs with a switch to select the impedance. Regarding the manual ... Well, if y 'was not what would be the same. Very simple configuration and in terms of sound it's plug n play. equalization in the middle and it sounds. Attention, the clean channel sounds very strong so do not force the volume. I play the big death, a bit old school. And here I am super happy. Used with a 7-string ibanez emg equipped 817 in D given a flying V and also mounted with a emg 81 it sounds bold but accurate. on the other hand for blues or rock I'm less sure. Therefore oriented metal. The two channels are close enough to the saturation of each other, what I see as my difference is that channel 1 sounds older (90 years) and two more modern (Nu metal what.) But do not try the overdrive, it's clear his or saturation. I've had a year and a half. What convinced me is the price and sound. No worries about playing with a logger to the battery power is there. Forget any use apart 'on the other hand but it is not made for that. Plan on buying a noise gate with (necessary). The small black dot is the very breath now. After a one gate input and output it in a hush settled. I compared with an essentially dual rectified and I am not disappointed. Obviously the mesa and above but not that far. So to see the value for money. Metalheads I advise you to try it! Honestly I never think to change it. With reverb effects loop is perfect.